Finally getting to the end of my "base" makeup drawer today with all my highlighters and bronzers! Next to blush, highlighters are my makeup love language. To this day I can still remember my first highlighter I ever got (find out which it is below!) and catapulted me into my makeup obsession. It's the one makeup product that I'm guaranteed to get complimented on in real life and one of my "deserted island" picks. My personal highlighter tastes range from the super subtle to the "you can see this glow from space," and like blush, I don't think a look is completely "done" without it. Now I am aware those bright and shimmery powders can be quite intimidating when you're looking at them in the pan. The last thing you want is to look glittery, clown-ish, or the absolute worst -- sweaty. My tips to find the perfect highlighter is to look for one that is glitter-free, smooth and fine to the touch (read: not chunky), and most importantly in a color that will compliment your skin tone. When it comes to placement on the face you want to focus on high points of the face to really make them pop and emphasize your bone structure. Foolproof highlight points are the tops of the cheekbones (start at the end of the eye and work your way up to the start of the temple), above the highest point of your eyebrow arch, and cupid's bow. Two other popular points, but require a bit more precision, are the nose and forehead. The reason these are a bit tricker is because these are two points some people would not like to draw attention to and putting highlighter there will do just that! For the nose, stick to just the bridge of the nose stopping before the tip (unless you'd like this to look bigger). For the forehead, I recommend using a very fine and subtle shimmer right on the center with an extremely light hand. Do not use anything glittery, shimmery, or with a cream formula, as that will take your look from glowy to sweaty realllll fast. This was the first cream formula highlighter I ever tried and I received this sample size in a Birchbox one month. From the first swatch I was obsessed and questioned why I hadn't tried a cream formula sooner, especially since I'm a big fan of dewy skin. I've been rationing this sample for so long, but unfortunately it's starting to get a bit grimy, so to the trash it goes. I am getting a full size ASAP because I love how well it sits on the top of the skin! Online it looks quite dark, but when swatched it's the perfect neutral and natural shade that will work on everyone. It looks really pretty on the cupid's bow and dabbed on the center of the lips to make them appear a bit bigger. For quite a few years I was really into Youtube, watching just about every girl in the beauty community nonstop. Jaclyn Hill was one of my very favorite beauty Youtubers to watch. She wore extremely glamorous, full face looks that I never would, but yet was so transfixed by her videos feeling both entertained and educated watching her apply and talk about the products she used. Highlighter was Jaclyn's favorite product and she became notorious for it. So notorious that she collaborated with Becca Cosmetics (who are known for their highlighters) to create a a slew of highlight and face products known as the Champagne Collection. This palette in particular was limited edition and of course I scooped it up the second it went on sale on Sephora (it sold out in under an hour, multiple times by the way). I was addicted to this palette for awhile, using it daily! The blush shades (Rose Spritz, Amaretto, and Pamplemousse) were extremely smooth and pigmented and the highlighters (Champagne Pop and Prosecco Pop) were out of this world! After a month or two I started to use just the highlighters and then eventually this palette just ended up sitting in the back of my drawer. The packaging is so big and bulky and since I only use the highlighters I decided it was time to part ways. I love Prosecco Pop but have an almost identical highlighter I'm keeping and I have a Champagne Pop stand alone highlighter that I'm keeping as well. This highlighter is another good one that just got surpassed by others in my drawer. The formula of this highlighter is very smooth and looks amazing on the skin. As the name would suggest it looks very "illuminating," which is exactly what you'd want in a highlighter! While it's not staying in my drawer, I would still recommend this to anyone and passed it off to my sister who took it happily. My love for theBalm doesn't stop with Mary. I have all three of their "Lou-Manizer"s! Next up is Cindy. Cindy is a pink shade that is very similar to Soap & Glory's Glow All Out from above, but I believe Cindy is much better in quality and performance. She's not as high shine as Mary, so if you're looking for subtle, this is a great pick. I also like to use this shade dusted lightly over blush for a bit more sheen and glow. Cindy would compliment those on the fairer side of the skin tone spectrum. This is technically marketed as a bronzer, but I use it as a combo highlighter/bronzer. Of the Lou-Manizers, Betty is best suited for tan and deep skin tones; but, I like to use this in summer when I'm a bit more tan or trying to look more tanned than I am since I wear such a high SPF on my face at all times. The reason I classify it both as a bronzer and highlighter is because I use it on places where highlighter and bronzer would be placed. I like to dust this on the outside corners of my forehead where bronzer would normally go and on the tops of the cheek bones and partially on the cheeks for a highlighted but bronze affect. I also like to dust this on the neck and chest to keep my face from looking too dark in contrast and it gives a really pretty glow in the sun. I just recently wore this the other day with the Charlotte Tilbury Hollywood Flawless Filter in the center of the face and LOVED the outcome. Champagne Pop was the inaugural product of Jaclyn Hill's Champagne Collection with Becca. This is described as a soft gold with sunny, peach undertones and I would completely agree with that. In the pan it looks quite orange but surprisingly looks good an almost everyone! I love this article by Allure where they tested out the product on 5 different skin tones. I'm most drawn to this product during the summer as it really compliments a tan. The shade is also carried in a cream formula I am very keen to try. This cream highlighter is my newest addition and new favorite too! I've been dying to try out RMS Beauty and in particular their cult product, Living Luminzer. This 100% natural highlighter is made with the highest quality coconut oil that doesn't clog pores, but melts into the skin to create the most natural glow ever! Rose Marie Swift, the line's creator, has been a celebrity makeup artist since the 60s and created this product herself, using it on clients before mass producing it for the world. It's now one of the most popular highlighters on Sephora. I love using this on no makeup days when I want my skin to look alive! I would recommend this product to anyone and everyone! One bonus of this product is that it looks amazing on more mature and drier skin that usually doesn't cooperate with highlighting products. While it is a bit pricey for such a small product, it is worth EVERY SINLGE PENNY, I promise! Bronzer is something everyone loves but I think are often confused by. Where to apply it? What color to choose? How to look tan but not orange? Do I use a matte or shimmer? And, what the heck is contouring? Who knew a brown powder could cause so many questions! Let's go back to the basics and discuss bronzing. Bronzing is a makeup technique to add color to the face and give the illusion of being sun kissed. Bronzing can be done with matte shades or with a slight shimmer/iridescence, and/or peachy undertones (like this product) -- stay FAR away from glitter! If you have light skin, choose shades that have a neutral or cool undertone (like the two powders above). If you are tan and deep you can get away with both cool or warm undertoned bronzers. The placement of bronzer is for areas where the sun would hit most prominently -- the hairline, the cheeks and cheekbones (lightly), and down the nose. Bronzer is placed in places very similarly to highlighter when you're only trying to achieve a warmed complexion. Contouring, in contrast, is about shaping the face by creating shadows. Contouring can be achieved with bronzers or contouring powders, but they need to be matte! Shimmers would contradict the purpose of the contouring, so stay clear of those. While contouring does depend on your bone structure and your own preferences, the usual places contour is found is on the hairline and sides of the forehead to create a smaller forehead (if have a short forehead steer clear of this), down down the bridge of the nose on either side leaving the middle clear for highlighter -- this creates a longer and slimmer looking nose, in the hollows of the cheeks to create the appearance of cheekbones and/or slim the face, along the jawline to slim and define the face, and lastly, I like to add contour down the sides of my neck to make sure my neck and chest match in tone with my face. That was A LOT of words and if you're like me and need visuals this is a great face map for bronzing and contouring. And if you want even further explanation, this Youtube video lays everything out from placement, products, and tools! My number one tip with bronzing or contouring is to use the right brushes (this one is my favorite!) and use a light hand and then build where needed. I like to go in front of a window so I can see just how much I'm actually putting on in natural light, because we've all been there when we pull down the car mirror and realize we are looking more oompa loompa than Victoria Secret model. No thank you. Because everyone's face and personal preferences are different, feel free to experiment with both techniques at the same time. I personally contour my forehead, hollow of my cheeks, and jawline to slim out my face and bronze my nose and chest to warm everything up and look cohesive. My personal stash of bronzers is quite little but I'm going to add a few more of my favorites in a slider below because I've tried and loved a bunch! Nothing to cut here folks! I just added this to my collection after eyeing it for years and I'm obsessed! The bronze shade is the perfect neutral with a very subtle iridescence that gives, as the name would suggest, a perfect sculpted glow. Also, the highlighter is out of this world beautiful! Whenever I'm packing for a trip this is the only palette I need. Charlotte Tilbury products are quite pricey, but I promise you will not regret this purchase at all. After becoming pretty confident in my makeup application abilities, I decided to finally try my hand at cream contouring. It definitely took some serious trial and error but after applying it in natural light and with an ultra light hand, I now reach for this more than powders! I use the second and third shade in the palette. 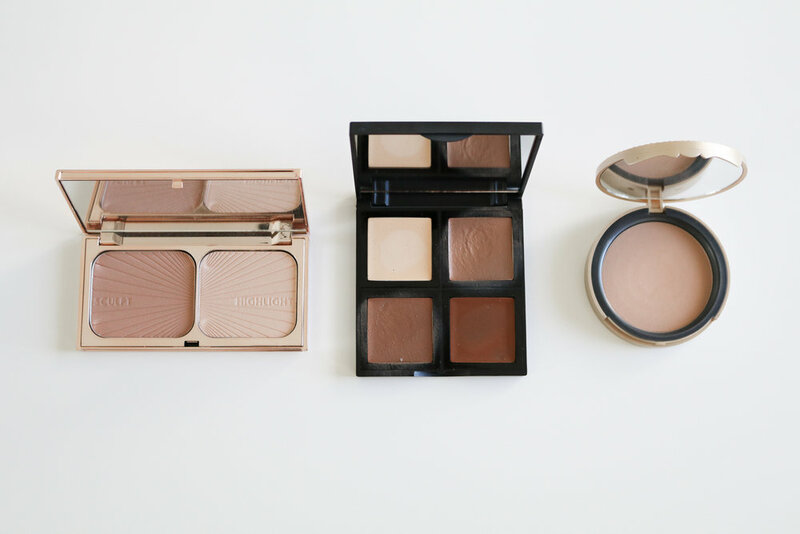 The second for contouring (it's cooler in tone) and the third for bronzing (a tad warmer). I find the best application is with this contouring brush from this affordable set! My tip with creams is dab the brush into the product instead of swiping to get less product and then blend the product in small, deliberate, swirling motions. If you feel you need the outsides to be better blended, dap a damp makeup sponge over top. If you're nervous to try creams out I highly recommend this product because its only $6, so you've got nothing to loose! Too Faced Chocolate Soleil Bronzers are a best seller for their amazing blend-ability, perfectly neutral toned shades that make bronzing or contouring easy, and their intoxicating chocolate smell -- yes, I'm serious, it is infused with real cocoa powder!! Yum! I love their names for their three different shades, "milk chocolate" for light skin, "chocolate" for medium to tan, and "dark chocolate" for deep. The bronzer is a no brainer to have in your collection, but I'd honestly buy it just for the chocolate smell, it's THAT delicious.